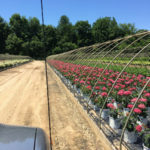 On July 12, 2018, the Virginia Nursery and Landscape Association (VNLA) held their annual summer Field Day at Colesville Nursery in Ashland. This event was exceptionally well-attended by over two hundred nursery, landscape, and allied industry members. There were several excellent speakers and demonstrations during the day along with a tour of Colesville’s growing and re-wholesale operations. SRN was represented by John Biche, Paul Eden, Cole Darby and Matt Deivert.